There are different definitions of product quality. What is actually meant by quality? How do you measure it? As you may realize in the following, quality has many facets and is more complex than it seems. Quality has been the subject of many and varied definitions. Each definition has both strengths and weaknesses in relation to criteria such as measurement and generalizability, managerial usefulness and consumer relevance. We will investigate each of the five definitions of product quality in the following. According to the transcendent approach, quality is synonymous with innate excellence, absolute and universally recognizable: ‘You will know it when you see it’. The origin of quality as excellence dates back to the Greek philosophers who referred to it as ‘the best’, ‘the highest form’, or ‘the highest idea’. According to this approach, the title ‘quality’ should only be attributed to those products and services that achieve the highest standards. But what is to be said of the rest then? Clearly, this approach has some shortcomings. Unlike the Greeks in ancient times philosophizing over the concept of quality, practitioners in the world of business seek something much more practical. For them quality should be capable of implementation, delivery and measurement. We will therefore in the following consider several more sophisticated definitions of product quality. 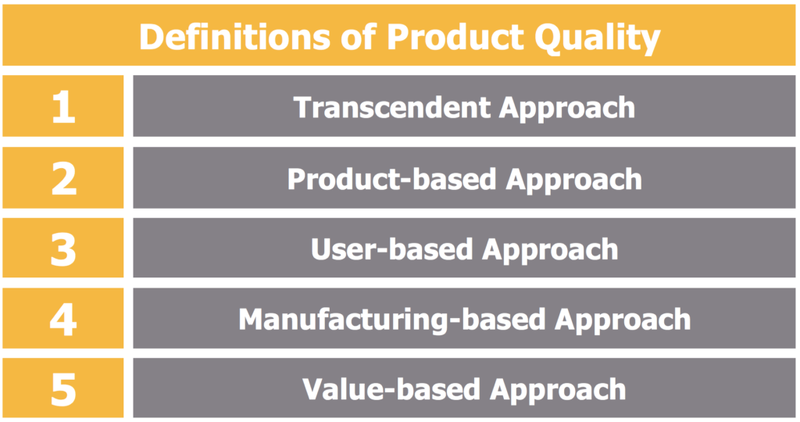 The emphasis in the product-based approach is on quality as a precise and measurable variable. Any differences (in quality) that do occur reflect differences in the quantity of some ingredient or attribute possessed by a product. This approach leads to a vertical or hierarchical ordering of quality. Products are raised according to the amount of ingredients or attributes that each possesses. However, an unambiguous ranking is possible only if the ingredients/attributes in question are considered preferable by all buyers. This approach starts from the premise that quality ‘lies in the eyes of the beholder’. Consumers have specific wants or needs and those products that best meet their preferences are those that they view as having the highest quality. There are two problems with this approach. First, with so many different preferences in the marketplace it is obviously difficult arriving at an agreed definition of quality. Second, it tends to equate quality with satisfaction. A product that maximizes satisfaction is certainly preferable to one that meets fewer needs, but is it necessarily better? The user-based approach focuses exclusively on the customer in the determination of quality. The strength of this approach is that it allows the customer the say in defining quality. However, this strength may also be viewed as a weakness. The reason is that expectations can also be highly varied, and personal, which can be problematic. Furthermore, customers may not be in a position to articulate their expectations due to a lack of knowledge and understanding. Whilst the user-based approach to quality is rooted in the subjectivity of consumer preferences, the manufacturing-based approach, as the name suggests, focuses on internal matters. It refers to conformance specifications. Products are designed and manufactured according to predetermined specifications. Quality control techniques help to detect deviations from the specification. In the case of services, the measuring of quality may be more difficult. However, under a process of standardization or routinization (McDonaldization of Services), services are subject to a form of standard operating procedures or models, which helps in the measuring of quality. In contrast to quality as absolute, the value-based approach regards quality as relative to price. According to this view, the buyer’s perception of value represents a mental trade-off between the quality or benefits perceived relative to price paid. Buyers, in effect, use price as an index of quality as well as an index of the sacrifice that is made in purchasing it. Of course, price does not always reflect quality.